Pop culture can be as forbidding as it is inviting, particularly in areas that invite geeky obsession: The more devotion a genre, series, or subculture inspires, the easier it is for the uninitiated to feel like they’re on the outside looking in. But geeks aren’t born; they’re made. And sometimes it only takes the right starting point to bring newbies into various intimidatingly vast obsessions. Gateways To Geekery is our regular attempt to help those who want to be enthralled, but aren’t sure where to start. Want advice? Suggest future Gateways To Geekery topics by e-mailing gateways@theonion.com. Why it’s daunting: The West Coast was a haven for studio-rats in the mid-to-late ’60s, as young technophile musicians moved out of the garage and onto Sunset Strip, where they soaked up all the rock, folk, psychedelia, and Top 40 floating around and tried to synthesize it. Some, like Brian Wilson and John Phillips, set the pace for how pop music could and should sound in the Flower Power era: at once starry-eyed and wistful. Meanwhile, fellow travelers like producer/songwriter/performer Curt Boettcher toiled away with less success, forming and dissolving bands and making records that would later become highly sought-after on the collectors’ market. These big-timers—along with the countless musicians and bands who landed a single hit that exemplified the tenor of the times before disappearing into obscurity—contributed to a style that nostalgists would later dub “sunshine pop.” Influenced by the pretty sounds of easy-listening, the catchiness of commercial jingles, and the chemically induced delirium of the drug scene, the sunshine pop acts expressed an appreciation for the beauty of the world mixed with a sense of anxiety that the good ol’ days were gone for good. But since no one at the time self-identified as “sunshine pop,” it can be difficult to pick through all the bands named after fruits, colors, and/or cosmic concepts and determine which ones fit the particular mood and sound of the genre and which ones are more properly classified as surf music, folk-rock, bubblegum, garage-rock, or straight-up psychedelia. (To be fair, there’s a lot of crossover between genres.) Also, since there were so many here-and-gone bands who tried to keep up with the trends—and since the sunshine pop bands were largely ignored by the major rock critics of the time—it’s hard to know which are worth more than a cursory listen. Why: The best songs and albums of Brian Wilson and John Phillips are so well-known that it’s hard to hear them as part of any kind of trend. The work of Curt Boettcher is another matter. First making his mark as part of the early ’60s folk group The GoldeBriars—where he showed a knack for complicated vocal arrangements—Boettcher became an in-demand producer for acts who combined the dreamy with the catchy, like The Association, for whom Boettcher produced the hit singles “Along Comes Mary” and “Cherish.” Boettcher formed his own band, The Ballroom, and recorded an album for Warner Bros. that went unreleased, but got passed around among other young studio wizards like Wilson and Columbia Records songwriter/producer Gary Usher. Boettcher joined the Columbia fold and helped Usher with his experimental pop band Sagittarius, while assembling some of the top songwriters and session-men in Los Angeles for his own project, The Millennium. On the surface, the music Boettcher recorded with The Ballroom, Sagittarius, and The Millennium—much of which can be found on the triple-CD compilation Magic Time: The Millennium/Ballroom Sessions—is right in the mainstream of radio-friendly pop from 1966-68. 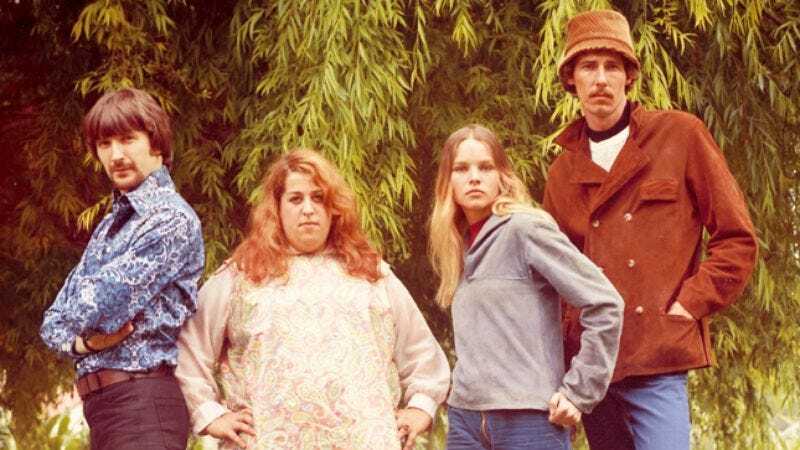 His songs had the angelic harmonies of The Association and The Mamas & The Papas, the aspirational naïveté of The Beach Boys, the live-inside-the-music atmospherics of The Beatles, and the lysergic tinge of every California band from San Francisco on down. But Boettcher and Usher were also interested in the avant-garde and classical music, and their highbrow approach to the sweet and fluffy didn’t connect in an era where rock ’n’ roll was getting harder and rowdier. Both Sagittarius’ debut album Present Tense and The Millennium’s debut album Begin were expensive flops for Columbia in 1968, and Boettcher and Usher lost their wunderkind cachet. Which is a shame, because Begin is a stunning piece of work: a late-’60s pop masterpiece to rival The Zombies’ Odessey And Oracle and The Moody Blues’ Days Of Future Passed. Some of Boettcher’s more far-out songs—like the dissonant “Anthem (Begin)” and the droning “Karmic Dream Sequence #1”—are over-indulgent, but the vast majority of the songs on Begin are tightly constructed and bursting with melody, stopping just short of being cloying. Boettcher was interested in sonic escapism—records that evoked the fantasy of sun-dappled afternoons spent with friends or lovers—but he understood that it takes a little melancholy to accentuate the joy. Songs like Begin’s “I Just Want To Be Your Friend” and “The Island” have an undercurrent of desperation as Boettcher tries to define a potential idyll, while “I’m With You” (written by Lee Mallory), “5 A.M.” (written by Sandy Salisbury), and “To Claudia On Thursday” (written by Michael Fennelly and Joey Stec) are more openly optimistic and romantic. Whatever the tone, the songs teem with chime, shimmer, and background “la la la”s, creating a world of wonders for listeners to fall into. Though Brian Wilson’s “teenage symphony to God” innovations were hugely influential on the sunshine pop acts that followed, The Beach Boys’ music was rarely in step with the genre. Their early albums were more surf music, then by the early ’70s, The Beach Boys were weaving between old-time rock ’n’ roll, California singer-songwriter fare, and Wilson’s unclassifiable madcappery. Still, the orchestrations of Pet Sounds alone were copied by top L.A. producers and DIY-ers alike, and though the highly sunshine-y album Smile remains unreleased (for now), the salvage-job Smiley Smile is anchored by the singles “Good Vibrations” and “Heroes And Villains,” which are very much in the spirit of the sound. Following in the footsteps of The Mamas & The Papas, The 5th Dimension became one of the few “sunshine pop” acts consistently to crack the upper reaches of the Billboard charts, by taking the songs of offbeat pop craftsmen like Laura Nyro and Jimmy Webb and dressing them up with a little Broadway and Bacharach. The band was responsible for some of the most impeccably arranged singles of the late ’60s and early ’70s, but also made one of the era’s loveliest albums with The Magic Garden, an all-Webb-penned record (aside from one Beatles cover) that evokes the feeling of taking a neighborhood stroll, lost in thought, letting all the external stimuli shape the mood of the day. Almost more fascinating than well-heeled Los Angeles musicians indulging their grandest pop fantasies were all the bands that tried to recreate that sound on the cheap. In New York, music student Chris Dedrick enlisted his family to make records full of happy-sounding songs about kites, umbrellas, and spirituality. But while The Free Design’s subject matter was cutesy, its music was quirky and sophisticated. The cover of the band’s fourth album, 1970’s Stars/Time/Bubbles/Love, sports a pretty-looking abstract paint spatter, which fairly describes the jazzy rhythms, impressionistic lyrics, and complicated vocal arrangements inside. New York was also the home of Michael Brown, who led the beautifully melancholy pop band The Left Banke to success with the singles “Walk Away Renee” and “Pretty Ballerina,” then produced and wrote the songs for the lone album by New Jersey’s Montage, a band that aped The Left Banke in its predilection for somber moods and gorgeous harmonies, yet filled out its sound with sunshine-pop-style orchestrations. Up the road in Boston, Chamaeleon Church did the soft-psych-pop routine better than most, and though the band is best-known now for its drummer—a dude named Chevy Chase—the self-titled debut album features fine long-line melodies that are far more complex than a listener might expect from a bunch of songs about flowers and blueberry pies. The Yellow Balloon and The Sunshine Company exemplified the kind of L.A. bands cobbled together by songwriters and scenesters looking to catch a break. The Yellow Balloon’s slick, snappy self-titled debut album was masterminded by ace pop songwriter Gary Zekley, and featured Don Grady of My Three Sons fame. The Sunshine Company, meanwhile, recorded three albums of gentle folk-rock enhanced by strings and woodwinds, the best songs from which have been anthologized by Collector’s Choice (which, along with Sundazed, has been one of the most reliable labels for sunshine-pop diggers). Actually, a lot of the finest music to come out of the sunshine pop era can be found on the multi-artist anthologies that started coming out after the genre began to find favor with indie-rockers in the mid-’90s. (The Rhino Nuggets offshoot Come To The Sunshine is a good place to start.) And given how prevalent the sound was in the industry in the late ’60s, many pop and rock acts not usually associated with sunshine pop recorded singles or even albums that would flow seamlessly in and out of any of the music above. Case-in-point: Chad & Jeremy, who became international superstars post-Beatles, and later recorded two ambitious psychedelic albums with Gary Usher. In between those two phases, the breathy folk duo recorded the lush, pretty album Distant Shores, which has a sound as forlorn and fleeting as the ocean sunset on its cover. Boyish pop star Tommy Roe also stepped into the sunshine briefly, working with Curt Boettcher on the winning LP It’s Now Winter’s Day, which proves that all it takes are a few trippy tweaks to turn straight-ahead Top 40 fare into a full-blown sonic experience. Usher and Boettcher’s own nexus of projects also continued to produce some memorable music. Usher’s Sagittarius was both poppier than Boettcher’s The Millennium and, at times, edgier. Sandy Salisbury worked with both of Usher and Boettcher’s main bands, and recorded the fantastic album Sandy—a more aggressive take on sunshine-pop that was recorded in 1968 but didn’t get an official release until 2000. And as a solo artist, Boettcher leaned more toward country-rock, though his 1973 debut, There’s An Innocent Face, is plenty poppy too. Finally, while Boettcher helped define the sound of The Association, some of the band’s best work happened post-Boettcher. The 1968 classic Birthday is a shiny, happy, groovy record that finds The Association dancing around the edges of psychedelia without ever losing the beat. A lot of rock fans have a tendency to pull up short on the poppier wing of the ’60s West Coast rock scene, sometimes accepting The Beach Boys into their lives, but resisting acts like The Mamas & The Papas and The Association, even though those bands and many of their sunshine-pop peers were as innovative and sublime in their way as Brian Wilson. Just listen to The Association’s “The Time It Is Today,” with its delicate harmonies and supple hum. It’s a gorgeous song, with an unusual structure and moments—like that murmuring “I know”—where a little trapdoor opens, revealing unexpected depths. The genre doesn’t get much better than this. Where not to start: Just as there are a slew of worthy box sets and single-disc compilations with “sunshine” in the title, so there are a bunch of anthologies collecting the best of bubblegum. There’s some crossover between the genres—and some good sunshine-y singles buried on bubblegum comps—but by and large, bubblegum lacks the emotional richness of the best sunshine pop and gets exhausting quickly.